Here in Northern California, the weather is usually nice. We get all four seasons — spring, summer, autumn, and winter. When winter officially started this year, it wasn’t actually that cold. Today, however, was FREEZING… literally FREEZING. I know a lot of you live in parts of the world where you get to experience snow all the time, but where I live it hardly happens. Everything was frosted and icy this morning when I went to see my therapist. Earlier this week, Hilo caught a cold. He was shivering, and his body temperature was warmer than usual. Anyway, he’s gotten much better with sleep and rest. 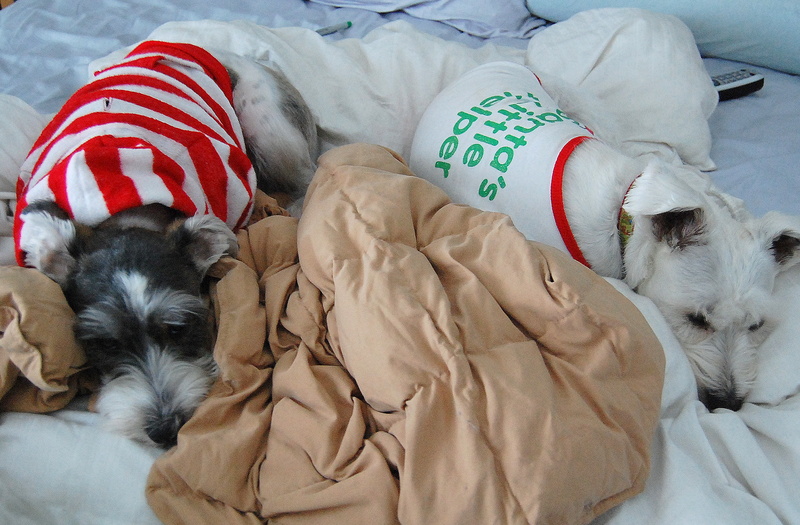 To prevent them from being cold at night, they now have to wear clothes. "...but Mom, do I have to?! It's way too cold to get up and start my day!" Please make sure that if you have pets that usually stay outside, please have the heart to bring them into your home during the cold winter nights. You wouldn’t want to be out in the cold, and neither do they. ….and a very BIG thank you to Sara for sending me a box filled with presents! You are too sweet! maybe you should tell our neighbors to put their dog in the house. btw, i saw the squirrel barker dog running back and forth in the cold. geez people! love the latest LO, i can’t wait for this horrible work week to end. Ahhhhh Sarah…those pictures of your doggies are sooo sweet!! I LOVE the clothes they’re wearing!!! And your comments are so funny! LOVE your layout, beautiful colors! And your Happy Mail is gorgeous, the cupcakes are GREAT!! And I love Thickers!! Our winter also started nice. Well, much rain but nice temperatures. But I just heard the weatherforcast for next week and there we go: it’s going to be FREEZING cold, just like at your place! Brrrrrr…..give me Summer!!!!!! Aww, how sweet are those photos. Love the lo and the color scheme! TFS and stay warm. Oh poor Hilo! Sending get well kisses his way. Love the sweaters. Hope the little ones stay warm and cozy – and you too! Love that layout – what fun papers! have a great week! I found Waldo! He’s sitting next to Maui. So super cute!!! Way to use the Kiki Art!!! And the pups of course are precious!! I can’t wait to see more and so happy to be on a team with you!!!! Hugs! 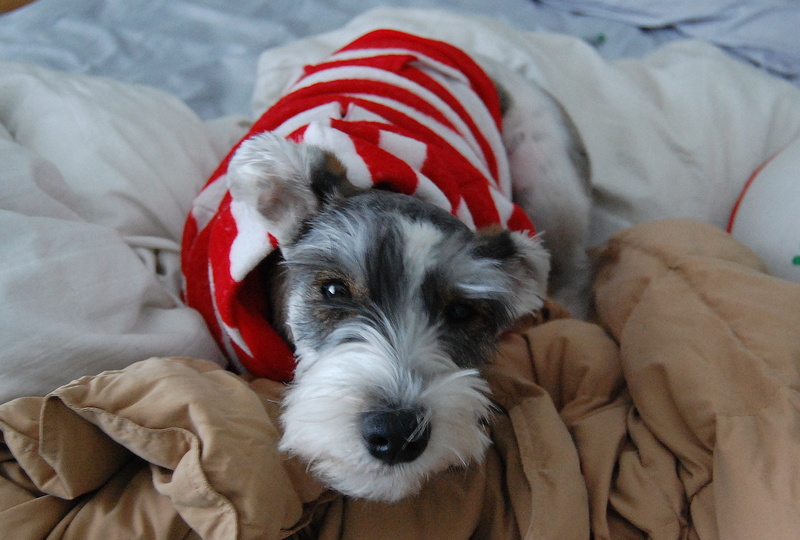 love the pictures of the puppies in bed in their sweaters…absolutely adorable!!!! the cupckae kit that your friend sent you is super cute…can’t wait to see what you do with it!! “Hardly happens” you say? More like NEVER happens where you live! love those pics of the furbabies!! Mollie just got her hair cut and with the cold weather we are having, she is wearing a sweater too. She sleeps under the covers all night too! Another totally ADORABLE LO! 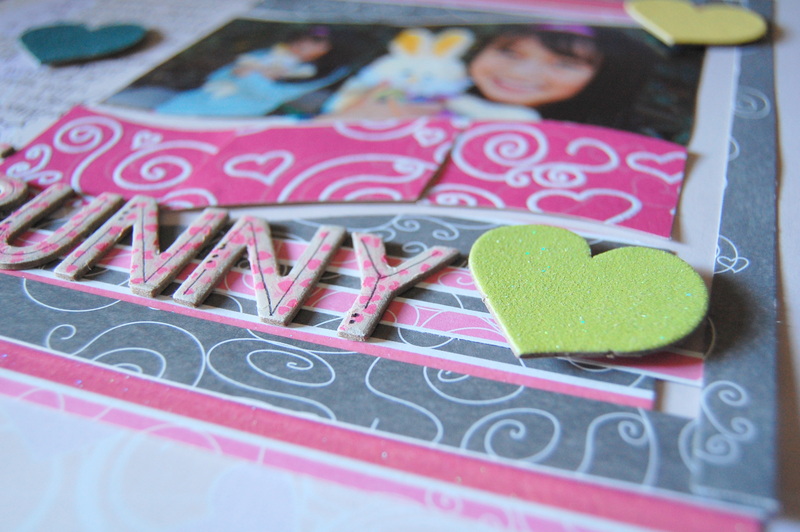 I ♥ how you added some dimmension by popping up a small area of your pink swirled paper! Soooo CUTE!